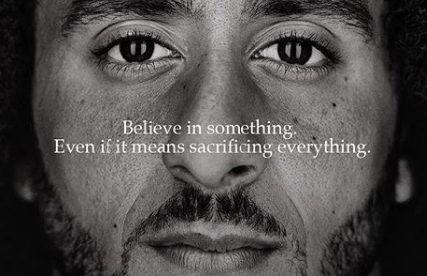 On the 30th anniversary of Nike’s “just do it” campaign, Nike made Colin Kaepernick, former backup quarterback and professional activist, the face of the campaign. Nike has been paying Colin Kaepernick since 2011 when he first signed a deal with them. It is Nike’s right to do this but let’s examine why that was not the smartest choice. Not standing at attention during the National Anthem is the biggest slap in the face a person could do to this country and our countrymen. During the 2016 NFL season when Kaepernick started this tirade, he made his position clear. He hates America and what it stands for. He even said, “I am not going to stand up to show pride in a flag for a country that oppresses black people and people of color,” citing shootings of black men by police and what he called “systematic oppression” of minorities. Yet he has no problem taking its currency. In the commercial Nike compares Kaepernick’s protest with acts of valor and accomplishment. Including: a girl in a wheelchair dribbling two basketballs, Shaquem Griffin playing football with one hand and even a boy born without legs wrestling and doing pushups. Those people have achieved something, making something of themselves after beating the odds and overcoming things they couldn’t control, like poverty and disabilities. What did Colin Kaepernick do? Nothing. He had a solid home life and was born healthy. He chose to protest the anthem by kneeling, he overcame nothing. He is making more money being a spokesperson than he would being a benchwarmer in the NFL. Let’s breakdown the craziness in this commercial: First, thinking that simply believing in something is a meaningful goal, rather than accomplishing anything is absurd. Secondly, Kaepernick has sacrificed nothing. He hasn’t been employed because he’s a disease in the locker room and not a good quarterback. Nike spare us the “Colin Kaepernick is a hero” nonsense. If you wanted a real hero from the NFL to lead your campaign you could’ve picked Allejandro Villanueva, Pat Tillman or even Glen Coffee. Maybe even Larry Fitzgerald or JJ Watt. Kaepernick even got endorsement from a former leader of a terrorist-sponsoring state – Iran’s former president Mahmoud Ahmadinejad. Who even tweeted: “The #NFL season will start this week, unfortunately once again @Kaepernick7 is not on an NFL roster. Even though he is one of the best Quarterbacks in the league.” Nike’s workers in some countries deal with denial of wages, unsafe conditions and other hazards. Kaepernick won’t stand for the American flag, but has no problem taking a paycheck from a company that uses child labor and exploits minorities for their own personal gain and profit. The whole story that Colin was a poor kid, born to a single mother is a pile of rubbish. He was just a few weeks old when he was adopted by a wealthy white family in Wisconsin. Who raised him with religion and structure, giving him a good homelife. Yet this is the man who wore socks depicting cops as pigs, defended Fidel Castro by likening him to America and even wearing a t-shirt showing a 1960 meeting between Castro with Malcolm X. “I’m not talking about Fidel Castro and his oppression. In endorsing Fidel Castro, Kaepernick defends police brutality, racism and torture or murder of political dissenters, all the things he claims tarnish America. In this situation, refusing to stand for America’s flag becomes a rejection of the values that Kaepernick claims to represent, now Nike has rejected those values too. A big deal is that Mr. Kaepernick donates his money to charity. The NFL is not colluding against Kaepernick. To be clear, Colin turned down a contract offer from the 49ers, Bronco’s and the Canadian Football League, because he refused to restructure his contract and give up money. Colin Kaepernick’s career stats as a 5-season starter include: a losing 28-30 record, a 59.8 completion percentage, a 88.9 QB rating, 40 fumbles, and a 72-30 TD-int ratio. All of which are terrible by NFL standard. The man who took over for Kaepernick at the time had a 5-22 record as a starter, a 22-24 td-int ratio, a QB rate of 66.4. Spare me the malarkey that Kaepernick is a good quarterback. It’s true that his reputation in part will be why he’ll be sitting on the sofa when the new season starts. It’s not because of ‘racism,’ it’s because of the distraction he brings. It’s why Tim Tebow is no longer a quarterback. Both aren’t good enough or have too much baggage to be an asset to an NFL team. Even if Kaepernick’s not protested he’d likely be riding an NFL bench today. With those stats he couldn’t even compete for a job on the Cleveland Browns. Basically, following the same suit as Chris Simms, a subpar talent who in a few years after retirement would become a part-time commentator on some sports network. This is the path Kaepernick chose. Look at his return: international fame, accolades from the media and the American Left, a lucrative deal with Nike, etc. This probably explains why Kaepernick turned down the offers he received. Tim Tebow was so desperate to play a sport that he now plays minor league baseball for the Mets. Kaepernick has not demonstrated any determination to work his way back into the sport. He has a profitable gig that doesn’t involve mini camps or injuries. Kaepernick’s transition from subpar quarterback to Professional Social Justice Warrior has been economically smart. Maybe KP Industries needs a new spokesman?